Design educators and professionals are challenged with identifying what constitutes appropriate and effective research. They must bring this knowledge to the classroom with the assurance it will serve students well in their practice. Currently, most educators’ methods are replete with intuition and anecdote. How might we reach a position that is academically sound and professionally valuable when put into action? Connecting Dots explores the ideas, ideals, and practices of design educators and professionals as they together investigate research. 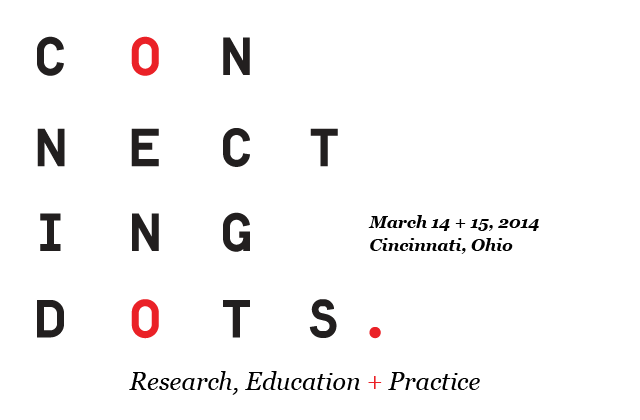 On March 14 and 15, 2014, fellow design faculty, students, and professionals met in Cincinnati, Ohio, to hear noted speakers and panels, roundtable discussions and other learning activities. Conference conclusions will be published with proposed research directions for communication design. Annette Diefenthaler is a Senior Design Research Lead at IDEO’s New York studio. She focuses on creating a deep understanding for people’s behaviors and needs that translates into meaningful design outcomes. Annette is particularly interested in evolving methodologies for Design Researchers’ changing role in today’s market environment. Since joining IDEO in January 2008, Annette has lead teams in designing diverse solutions such as bank branches, toys, hospital experiences, digital experiences and a future vision for a university. Her work has been recognized with multiple design awards. Annette’s true passion is bringing human-centered design to systemic challenges in education. She has worked with clients in K-12 and higher education, rethinking what learning tools and experiences might look like, helping entrepreneurs understand how to design for this context and envisioning a new educational model for an entire state. Annette is a co-author of IDEO’s Design Thinking for Educators Toolkit. She regularly speaks about her experiences and enjoys sharing Design Thinking with diverse audiences. As an evolution of her teaching experience, she is currently designing a Fellowship Program for non-traditional students at The New School of Public Engagement with Dean David Scobey. Now based in New York, Annette grew up in Germany and has lived and worked in many cultural contexts, including Russia, the Middle East, Asia and Australia. In her free time, she is mostly to be found training for her next marathon. Jorge Frascara is Professor Emeritus of the University of Alberta, Canada, Fellow of the Society of Graphic Designers of Canada, and member of the Editorial Boards of the Information Design Journal, Visible Language and Design Issues. He has held leading positions at the University of Alberta, Icograda, the ISO, the Society of Graphic Designers of Canada, the Graphic Design Education Association (USA) and the Canadian Standards Council. He has published nine books and more than 50 articles internationally, and has lectured and made presentations in more than twenty five countries. Past clients include the Government of Canada, the Mission Possible Coalition (traffic safety), the Alberta Drug Utilization Program, Telus Canada and the Health System in Italy. He now lives in Puebla, Mexico, teaches at the University of the Americas Puebla, and runs an information design consultancy with his wife Guillermina Noël. Jon Kolko is Vice President of Product, Innovation, and Design at MyEdu, and the Founder and Director of Austin Center for Design. His work focuses on bringing the power of design to social enterprises, with an emphasis on entrepreneurship and large-scale industry disruption. He has worked extensively with both startups and Fortune 500 clients, and he’s most interested in humanizing educational technology. Jon has previously held positions of Executive Director of Design Strategy at Thinktiv, a venture accelerator in Austin, Texas, and both Principal Designer and Associate Creative Director at frog design, a global innovation firm. He has been a Professor of Interaction and Industrial Design at the Savannah College of Art and Design, where he was instrumental in building both the Interaction and Industrial Design undergraduate and graduate programs. Jon has also held the role of Director for the Interaction Design Association (IxDA), and Editor-in-Chief of interactions magazine, published by the ACM. He is regularly asked to participate in high-profile conferences and judged design events, including the 2013 Cooper-Hewitt National Design Awards. He has taught at the University of Texas at Austin, the Center for Design Studies of Monterrey, in Mexico, and Malmö University, in Sweden. Jon is the author of three books: Thoughts on Interaction Design, published by Morgan Kaufmann, Exposing the Magic of Design: A Practitioner’s Guide to the Methods and Theory of Synthesis, published by Oxford University Press, and Wicked Problems: Problems Worth Solving, published by Austin Center for Design. Sharon Helmer Poggenpohl has taught in notable design programs: The Hong Kong Polytechnic University, the Institute of Design at the Illinois Institute of Technology in Chicago, and the Rhode Island School of Design. Her focus over a long career has been post-graduate design education, both master and Ph.D., as well as design research. Taking a human-centered position with regard to design, she teaches to help students humanize technology, to learn to work creatively and collaboratively with each other, and to prepare them to contribute to building a body of design knowledge. For twenty-six years, she edited and published the international scholarly design journal Visible Language, overseeing the peer-review of hundreds of papers. She co-edited with Keiichi Sato Design Integrations, Research and Collaboration (Intellect Books, 2009). Currently, she is working on a book tentatively titled Design Theory-to-go, while teaching occasionally in Hong Kong. Liz Sanders is the President of MakeTools, a design research company with a focus on collective creativity and innovation. Liz introduced many of the tools, techniques and methods being used today to drive and/or inspire design from a human-centered perspective and has practiced co-designing across all the design disciplines. Her numerous design awards, publications, presentations, and her proven track record in the marketplace have established her as a global leader in the field of design research. Liz speaks about and teaches human-centered research and design to clients, colleagues and students around the world. Liz is also an Associate Professor in Design at The Ohio State University, where her focus is on facilitating transdisciplinary learning experiences and co-creation practices for addressing the significant challenges we face today. Karel van der Waarde: Graphic Design? Can We Convince Commercial Commissioners, Solemn Academics, & Worried Parents that it is Worthwhile? Karel van der Waarde studied graphic design in the Netherlands (The Design Academy, Eindhoven [BA]) and in the UK (De Montfort University, Leicester [MA], and the University of Reading [PhD]). In 1995, he started a design – research consultancy in Belgium specializing in the testing of information design. His company develops and tests information for patients, pharmacists, nurses, and doctors. Van der Waarde is a life-fellow of the Communications Research Institute (Melbourne, Australia), a board member of International Institute for Information Design (IIID, Vienna, Austria) and editorial board member of Information Design Journal, Iridescent, the Poster and Visible Language. Brian Stone, citizen of the world, works in the area of interaction design, information visualization, and user experience, and is an Associate Professor of Design at The Ohio State University. His work has garnered numerous awards for design excellence and he’s the author of several articles on the subjects of interactive experiences, usability, information design, and kinetic messages. He is a frequent speaker at conferences and universities and has held visiting appointments at the National University of Singapore, Escola Superior de Desenho Industrial (ESDI) in Brazil, and the University of the Arts. Apple Computer recognized Professor Stone’s teaching with the Apple Distinguished Educator award. He is also a recipient of the Alumni Award for Distinguished Teaching from The Ohio State University and the Order of Omega Faculty Recognition Award. His most recent collaborations include the development of educational strategies and instruction for Cooper a San Francisco based user experience design firm and SalesGlobe an Atlanta based sales effectiveness team focused on business innovation. What is the Design Educators Community? How can it support you as an educator? Join us as we discuss this topic and share new initiatives that the Community is currently proposing to AIGA. A discussion on how students can use the Internet as a research tool while still maintaining their own personalized voice in design solutions. What is transdisciplinary design? How is it distinguished from inter- and multi- and pluri-disciplinary design? Moreover, what is the utility of the idea of transdisciplinary design in terms of design curriculum? How can we understand how such notions are integrated into various design curricula and what is the basis for comparison between programs and curricula? A discussion of how visual communication is perceived in the professional world of design research and strategy. How can it be leveraged more strategically? What value are non-visual experts expecting from visual designers emerging from school? Most importantly, how can this skill set add to the art of research, and where might current academia be falling short in real world preparation?